As the bells began to ring, hundreds of people spread along the sidewalks to make way for the procession. I could see market-goers preparing themselves psychologically: some looked nervous; the littlest ones, downright terrified. 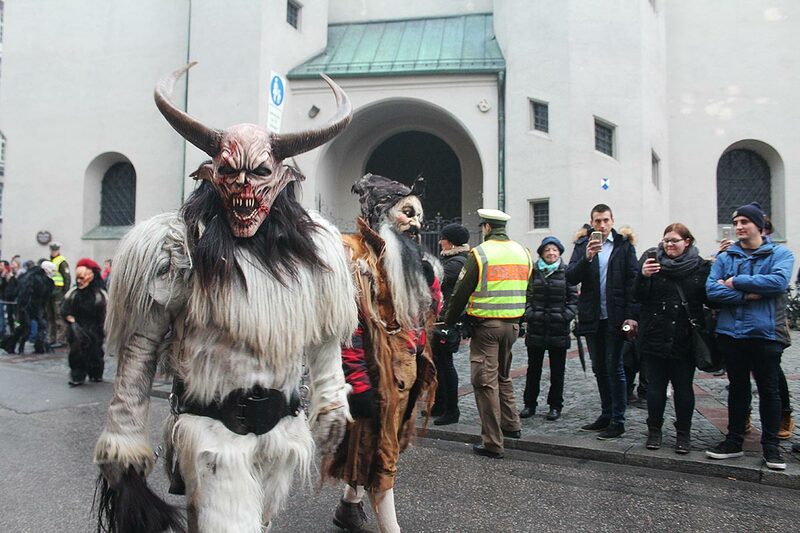 We were about to embrace the 500-year-old Christmas tradition of Krampuslauf—the Krampus run. But the horrors had yet to begin, and the Christmas spirit still hung in the air. Sparkling lights decorated every facade and street post surrounding the Christmas market in Munich’s main square, Marienplatz. 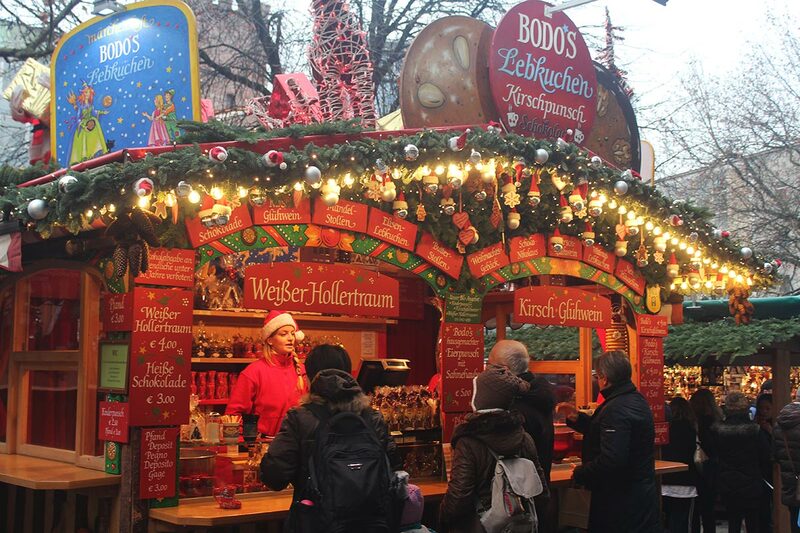 The smells were rich and inviting—vendors offering traditional mulled wine (glüwein), freshly baked gingerbread cookies and chestnuts roasted over open fires. In Munich alone, this is one of about 30 Christmas markets you can visit in as many days, ranging from traditional Bavarian and medieval ones in historic locations to new-age alternative pop-ups. At 20,000 square metres and with more than 160 booths, the market at Marienplatz ranks among the city’s largest. It snakes through the heart of the city, between the new city hall and Munich’s iconic two-domed cathedral. A seasonal staple of the city, the roots of this market date to the 14th century. But the history of the creature we were here to see dates back even further. In Bavarian, South Tyrol and alpine folklore, Saint Nicholas is rivalled by Krampus—a half-goat, half-demon creature still acknowledged in many parts of Central Europe. According to tradition, Krampus is sent by Saint Nicholas to do the dirty work and punish naughty youngsters. The tales are meant to keep children well behaved by basically scaring them into goodness. Forget getting a lump of coal in your stocking—Krampus steals misbehaving kids, throws them into sacks and carries away to the underworld, where they get either burned for eternity or sometimes simply eaten. How’s that for celebrating the most wonderful time of the year? I found myself in a sea of spectators, waiting to celebrate this anti-Christmas show. Dozens of Krampus creatures and their helpers soon emerged and started parading down the street. They were divided into groups, proudly announced with banners for each organization, who travel around visiting various runs during the season. They meet for months prior to the parades, organizing costumes, formations and plans, similar to the organization of other major carnivals. There are centuries of traditional craftmanship involved in the making of these demonic costumes. They vary depending on regional depictions, but most of them feature long tongues, giant fangs and sharp claws. 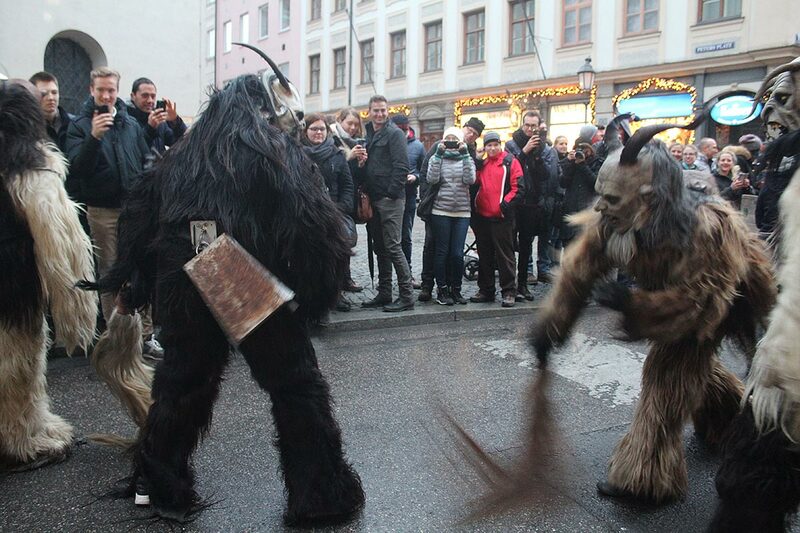 In fact, the name “Krampus” stems from the old German word for claws: krampen. 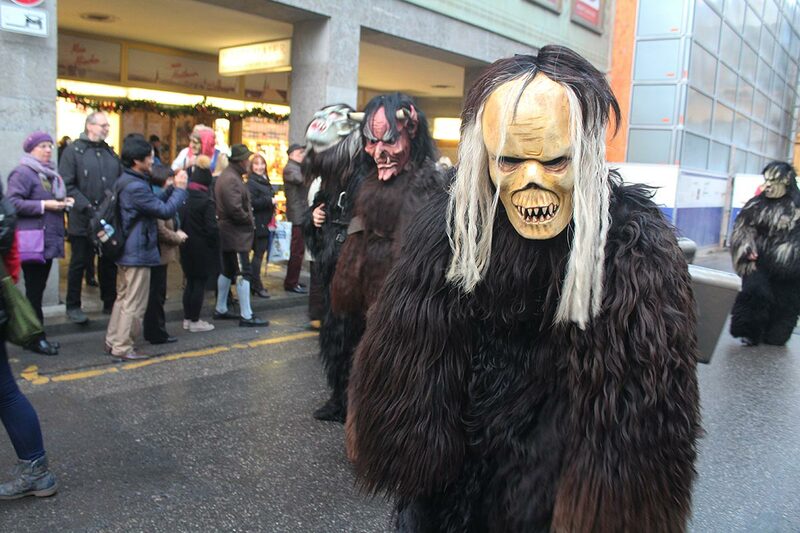 A costume from Salzburg showed Krampus covered in long sheep wool, while others were portrayed with intricately carved wooden masks. Such costumes are so elaborate, they can cost anywhere between 1,800 and 2,500 euros. All this is to say nothing of the weight: some masks alone can weigh up to 20 pounds! The Christmas market at Marienplatz, Munich. Rattling chains and cowbells attached to their backs warned of their arrival. Some eerily approached spectators, posed for selfies and snarled at innocent bystanders. Others scared the living Christmas lights out of onlookers by infiltrating the crowd and sneaking behind unsuspecting participants (including yours truly), garnering a good laugh from everyone else—until those laughing onlookers became the victim. Most people seemed to enjoy the festivities, letting out a relieved giggle after being frightened. One man in the front row kept calling the Krampuses over to pick on his wife. “Over here, over here!” he yelled in German. He was absolutely loving it; she seemed less amused. I foolishly thought hiding behind my camera lens would help me avoid direct eye contact with the creatures. But it turns out, having a noticeable accessory only singles you out as a target of the Krampuses’ wrath. In moments of vulnerability, they messed up your hair or stole your hat, leaving you no choice but to try and pry your precious beanie from their vicious claws. Getting hit with the Krampuses’ horsehair whips or birch sticks meant someone hadn’t been on their best behaviour this year. The most theatrical Krampuses even carried children off with them—before later putting them down to the relief (or dismay) of their watchful parents. Some of the masks can weight up to 20 pounds. I don’t know about you, but being whisked away by a horned demon during the holidays as a child would’ve likely traumatized me. But I guess other children didn’t like it either, as evidenced from the cries I heard throughout the market. The tranquil setting of Munich’s huge Christmas market came back into focus as the hundreds-strong, two-hour parade finally wound down. Carollers perched on the balcony of the city hall were singing cheerful classics, a sudden reminder that we were in fact celebrating Christmas, not Halloween. During my time in Munich, I experienced the exuberant holiday celebrations, truly some of the most magical in the world. But now I know that just like the weather outside, they can be also be a little frightful. A Tale of Two Airports: Is Berlin Stuck in the Past?